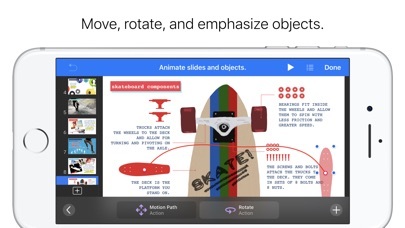 Keynote is the most powerful presentation app ever designed for a mobile device. 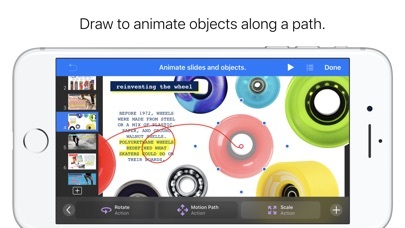 Built from the ground up for iPad, iPhone, and iPod touch, it makes creating a world-class presentation — complete with animated charts and cinematic transitions — as simple as touching and tapping. 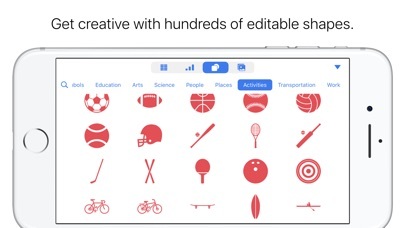 Start with an Apple-designed theme and add text, images, charts, tables, and shapes with just a few taps. Highlight your data with stunning interactive charts. Draw and write with Apple Pencil on supported devices, or use your finger. Present right from your iPad, iPhone, or iPod touch. 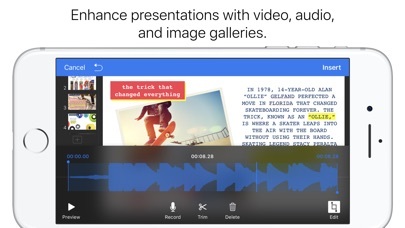 Or use Keynote Live to present a slideshow that viewers can follow from their Mac, iPad, iPhone, iPod touch, and from iCloud.com. 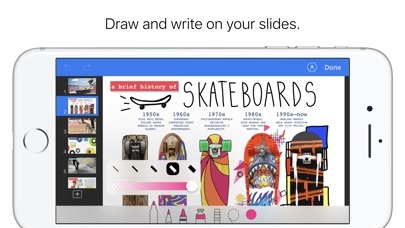 Preview your slides and notes on your device using the Presenter Display. With iCloud built in, your presentations are kept up to date across all your devices. And with real-time collaboration, your team will be able to work together at the same time on a Mac, iPad, iPhone, or iPod touch — even on a PC using iWork for iCloud. Collaborate with others at the same time • Your whole team can work together on a presentation at the same time using real-time collaboration • Collaboration is built right in to Keynote on the Mac, iPad, iPhone and iPod touch • PC users can collaborate too, using Keynote for iCloud • Share your document publicly or with specific people • Easily see who’s currently in the presentation with you • View other people’s cursors to follow their edits • Available on presentations stored in iCloud or in Box Get started quickly • Choose from 30 Apple-designed themes to give your presentations a beautiful start • Use the slide navigator to quickly skim through your presentation, add new slides, and reorder slides • Design your presentation using your choice of slide layouts, animations, fonts, and style options • Import and edit Microsoft PowerPoint files using Mail, a WebDAV service, or iTunes File Sharing • Quickly open password-protected presentations using Touch ID or Face ID on supported devices Create stunning presentations • Use predefined text styles or choose text options to personalize your slides • Easily change slide masters and backgrounds • Use donut charts to visualize data in an engaging new way • Add an interactive image gallery to view a collection of photos • Enhance your presentations with a library of over 700 editable shapes • Quickly add your photos and videos from the Photos app using the Media Browser • Edit down to the pixel with rulers and alignment guides • Use Instant Alpha to easily remove image backgrounds Cinema-quality animations • Beautiful cinematic slide transitions for easily creating stunning presentations • Magic Move effect to effortlessly animate and morph graphics • Gorgeous slide transitions including Clothesline, Object Cube, Object Flip, and Object Pop • Impressive text and object animations including Vanish, Crumble, and Fade and Scale Present to your audience • Rehearse a presentation with current slide, presenter notes, and timer all in one view • Keynote Live lets you present a slideshow that viewers can follow from their Mac, iPad, iPhone, iPod touch, and from iCloud.com • Present on an external display or projector; navigate slides, view presenter notes; stream wirelessly using AirPlay and Apple TV • Highlight with Apple Pencil while presenting on iPad Pro iCloud • Turn on iCloud to access and edit your presentations from your Mac, iPad, iPhone, iPod touch, and iCloud.com • Use Keynote for iCloud to access and edit your presentations from a Mac or PC browser • Keynote automatically saves your presentations as you make changes Share your work • Export your presentation to Microsoft PowerPoint or PDF format • Export your presentation as a movie or images Some features may require Internet access; additional fees and terms may apply. I do not use keynote for presentations, I enjoy it to create videos of any kind. It has features that are paid in other apps. The function that I enjoy the most, is to add GIF in PNG and the last update where I can draw the line that a figure will make, is great. As a video editor it is useful, the transitions are fantastic, I expect more features. I never thought about writing one of these for this app, but I might as well share the possibilities of it. A lot of people think this app is only for making presentations, which obviously that’s what it’s advertised as. But it can do so much more. This app is what I use for graphic designing. The simple shapes really help with making great logos and such. I’ve also even used to just to simply add text to a photo, or to make a meme. For photo editing it’s not half bad and for graphic design it’s brilliant! This one is a little more niche, but in Middle School I designed “games” on this app. They weren’t too much like games, it was hard to make anything more than a screen by screen side scroller type of game, but I’d be lying if I said this app didn’t push me further into game design than other apps ever have—as silly as that sounds—and really helped me out. It’s even possible to do animations in this thing, but I’m not an animator so I never did it often. Even just for presentations this is your best option. Amazing build effects, transitions, clean user-friendly UI, etc. Sure this is missing a few things that the Mac version has, but after the latest update I have hope that it’ll be just as good soon enough. If you’re not using Keynote to make presentations, or even any of the other stuff I mentioned, you really should get on that. I really like using apple built-in apps, because they get the most out of your hardware devices. And now with keynote they nailed it! Custom animation, with motion path, is... awesome! I’m not a pro, but I like apple and any piece of software they have mostly for their simplicity and clean interface! Minimalism at its best, I would say. Thank you, developers, thank you very much. For some reason, it’s no longer working with iCloud. Garbage! Keynote is pretty good. While it may not have features other presentation software has, it does have some individual characteristics. The animations are original and fun. The font selection is pretty good. The Magic Move features works so well. I don’t understand why people get so mad about no selection feature. If you’re that desperate, log onto iCloud on a computer, and go to Keynote. 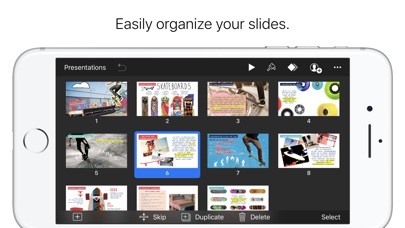 If you shared your presentations on iCloud, they should be there. You can select on computers. Overall, Keynote is really cool, and definitely beats out Slides and can compete with PowerPoint. Version 5 has a few bumps. If I edit my old lecture slides the file somehow gets corrupted and keynote will crash when I try to run the slides. If I delete the old slide and rewrite the slide from scratch then there is no problem. I have years worth of slides and I cannot rewrite them all. Hopefully this gets fixed soon. Besides that my experience with the app is very positive. I love it! Once I can edit old slides without crashing it is black to 5 stars. I am disappointed in Keynote since the iOS 12.2 upgrade. Remote iPhone control worked before; now it can’t stay connected. This may be a fundamental thruput issue. 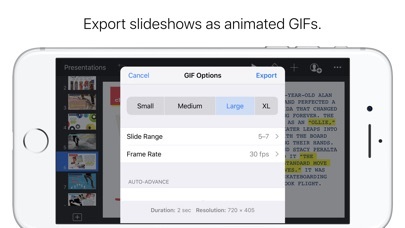 Slides with animation lose connection immediately. So far I’m getting shuffled around in Apple Support.